The Regency Hotel and Restaurant in Leicester has an excellent reputation for providing quality food. 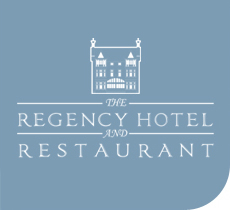 Two choices of dining are on offer at The Regency Hotel and Restaurant. Fully licensed and open to both Guests and Non-residents. The ‘Town House’ Restaurant which specialises in Traditional and Modern A la Carte cuisine within our elegant Victorian surroundings is one of the best restaurants in Leicester. Menu's are changed monthly to incorporate seasonal changes in tastes and flavours and all dishes are cooked by our chefs using the finest, top quality ingredients and specialist cuts of meats. Alternatively if you would like things simpler but with the same top quality ingredients then our “Langtry’s” conservatory is perfect. Serving a much more informal but just as tasteful menu, such as Pasta’s, Home made pie's, Fish and Chips, Jacket potatoes and Wraps. Which ever you choose your sure to return to The Regency time and time again. Over the years we have built up a great reputaition for Sunday lunches, which start from £9.35 per person. Why not call us to book a table or use the contact form to make an enquiry. Or friendly team would be happy to call you back and discuss any requirements yu may have. Special diets (Gluten Free, Vegan) are always catered for. Please ask what we can do for you. Did You know that we also offer an outside catering service. We have a repuation for being some of best outdoor caterers in Leicester. We can provide you with cold or hot buffets, or restaurant quality meals piping hot and direct to your door. With or without waiting staff. Whatever the occasion we can tailor make a package to suit you. Please ring or fill out a contact form for enquiries.